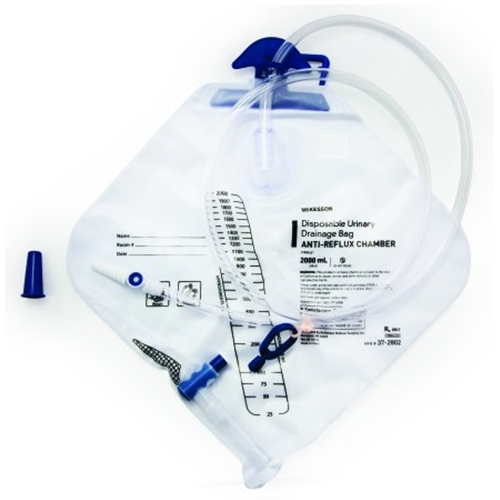 McKesson Disposable Urinary Drainage Bag from HealthyKin.com is durably constructed for odor containment and leak resistance. The anti-reflux chamber reduces gross reflux. A clothing clamp on tube can be used to attach the drainage bag to clothing to make sure the tube does not get twisted or dragged on the floor. excellent quality. very good drainage valve. much better than other comparable products. service and shipping from kin was superb. So much nicer than the Bard bags (the tubing on the Bards are too stiff). Was glad to find McKesson bags at a reasonable price. They have a longer tube which allows my husband to move more and we trust the closure more. This bag is being used off label to drain a stomach with a g/j tube and it lasts 1-2 weeks usually without getting any leaks. I like the mechanism for emptying the bag for reuse.